Three weeks on from stepping up to take charge of Hearts on a caretaker basis, Jon Daly has emerged as a strong and genuine contender to become permanent head coach. 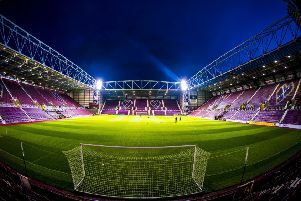 After the ill-fated reign of 31-year-old Ian Cathro was brought to an end at the start of the month, the consensus was that the Tynecastle board would stray from their preference of promoting from within and look to appoint an experienced successor in order to steady the ship. Appointing their under-20 coach to the role at such a critical time for the club was widely deemed unlikely, even if director of football Craig Levein has never doubted his credentials. However, Daly’s strong leadership since taking the reins – allied, of course, to a shortage of suitable senior candidates and the withdrawal of higher-profile options like Steve McClaren, Dougie Freedman and Billy Davies – has bolstered his prospects significantly. A creditable return of four points from three hazardous away games – at Celtic Park, Rugby Park and Ibrox – means the Hearts board have had no qualms about leaving the 34-year-old former Dundee United and Rangers striker in charge for a fourth match. If he can oversee victory at Motherwell on Saturday, Hearts will have collected seven points from three away games for the first time since October/November 2015. In addition to finding a way to stop the rot on the road, Daly has also impressed supporters, players and media with the way he has conducted himself. While there is not yet a unanimous clamour for him to be given the job, plenty are gradually warming to the idea. Victory at Fir Park would make it harder for Hearts to look beyond him. Craig Conway, who shared a dressing-room with Daly at Dundee United for four-and-a-half years, is in no doubt that his former captain has the strength of personality to handle being the main figurehead at Hearts. “Jon was always a commanding figure when he played,” Conway, the Blackburn Rovers winger, told the Evening News. “He was the type of guy you could imagine going into management. He was always captain material – he was a leader. The one thing that always came across was how well he spoke about the game, in terms of his thoughts and views on different things. He was always articulate. “He’s also a very strong character – that’s one of his main positives. When he puts his point across, he makes it known, and that’s a massive factor, especially going into management. Much was made throughout Cathro’s reign – from outside the club, at least – about his relative youthfulness, with the inference being that he might struggle to maintain authority in the eyes of the players. Although Daly would also be considered a managerial rookie, he is currently eight months older than Robbie Neilson was when he took the reins in 2014 and went on to prosper within the current structure. Gaining respect of the senior players at Hearts won’t be an issue for Daly, according to Conway. “Age is not really a factor in football any more,” he said. “Managers are getting younger and younger and a lot of them are going pretty much straight into it after playing. With its demands having left plenty big-name players and managers floundering over the years, it is widely felt that prior experience of the environment is a crucial element to prospering in Scottish football. Daly has spent more than a decade in this country; nine years as a bustling centre-forward with United, Rangers and Raith Rovers, and 20 months as head coach of Hearts Under-20s. The Dubliner also has a long-standing bond with Levein, the man who took him to United from Hartlepool in 2007, plus an in-depth understanding of how Hearts operate under the current structure and what their objectives are. Conway believes his old team-mate’s knowledge of the scene would reduce the chances of teething problems if he were to land the job on a permanent basis. “The fact Jon knows the league is a big advantage for him,” he said. “He’s been around it for pretty much the last ten years so he’ll know all the teams and the players, and their strengths and weaknesses, which can only be a good thing. He’s only recently finished playing so he’s very up to date with everything that’s going on. Squad morale dipped significantly amid a string of bad results under Cathro, but the Hearts players are currently enjoying working under Daly and keen for him to land the job. Creating a strong bond and a collective strength within the squad will feature high on his agenda. One drawback to Daly being appointed is that it would do little to quell the notion peddled by Levein’s critics that he prefers a rookie head coach so he can maintain a degree of power when it comes to first-team affairs. The director of football has made no secret of the fact he is there to offer advice and assistance when required, and to help with recruitment. Although there is no evidence of interference in team affairs from Levein, some supporters would prefer a senior figurehead to replace Cathro so it disproves the theory once and for all that the former Scotland manager is pulling the strings from behind the scenes. Conway scoffs at any suggestion that Daly would allow himself to be dictated to as he bids to accelerate his managerial career.